Our mental health can be both positively and negatively affected by a number of different factors. From our diets to the weather and our sleep patterns to the company we keep – many different aspects of our day to day life can have an impact on our mental health issues. Our relationships and mental health is one such aspect that is often overlooked as a factor in our own mental wellbeing and not commonly considered something we can take action on in order to make a positive effect on our mental health. Our interactions on a day to day basis can both alter our current mood, as well as lighten or worsen the symptoms of a range of different mental health issues. For example, having a friend who you can call to talk things over with or someone you can ask to watch the kids whilst you take a few hours for yourself, can have a positive impact on your day – and lift a huge weight off of your shoulders. And vice versa, having company around you who is unsupportive, judgmental or simply someone who has an overall negative impact on your mood can be detrimental to your mental health, especially when it is someone you spend a large amount of time with. If an interaction as minimal as encountering a rude cashier when you buy your morning coffee can throw of your mood for the whole day – imagine how our moods, reactions and mental health can be affected by the company we have on a regular basis. Romantic relationships in particular can have a huge influence – both positively and negatively – on our own mental health. Often when we’re in a relationship – whether it is newly established or long-term – we tend to spend the majority of our free time in our partner’s company. Those of us in positive and healthy relationships often find this partnership a positive way to move through life; with a constant support system, someone to take care of you through the more difficult times in life and someone to enjoy the good times with. However, those of us in toxic or negative romantic relationships often find ourselves trapped in a cycle of negatively – with little way out that isn’t walking away from an established relationship or someone who you have spent a lot of time or energy building a life with. Improving your mental health and taking the journey to recovery can be impossible without some sort of support – and no matter what steps you take yourself, if your other half helps to undo any positive steps you take, it can feel like there is no way out of your relationship and equally, no way to recover from poor mental health. Often, it can become a vicious circle – with us promising to leave toxic relationships as soon as we are mentally strong enough, or equally, us promising to work towards improving our mental health – as soon as we’re out of the relationship. 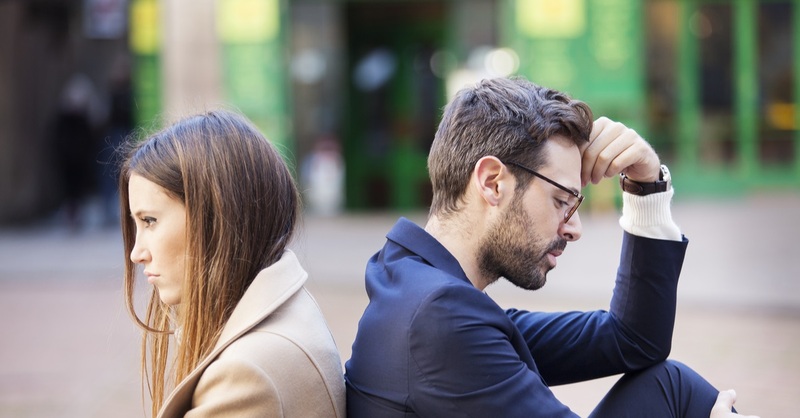 One of the biggest side effects of being in a toxic or negative relationship – especially over a long period of time – is the erosion of your sense of self-worth. When combined with depression, and other mental health issues, the decline in how you see yourself can happen extremely rapidly. Your self-image is often tipped, so rather than seeing yourself through your own eyes, you see yourself from the perspective of others around you – often making you hyperaware of your actions and sometimes warping your own personality – something that can take years to undo. It is currently believed that mental health issues can be inherited both genetically, and learned in the family home. As we grow we are shaped by the people we grow and live with, and throughout primary and secondary socialisation we learn particular behaviours by following those of the people around us. Whilst family should never be blamed for mental health issues – the reasons behind mental illness often come down to more than one factor – the way that our families act, react and interact is the foundation for the adults we will grow into. Very often families act similarly to a single person – and whilst each individual has their own personality, likes and dislikes – often their behaviours, actions and reactions are similar or the same. Families who come together and react calmly to times of hardship or stress, for example, may find their children have a much more relaxed approach when things go wrong later in life. Well as families who are more likely to respond with confrontation, anger or by brushing the situation under the rug may find their children reacting similarly as adults. As so much is subconsciously learned within the family unit, learning how to better deal with or manage our emotions, reactions and interactions – especially in front of our kids – could have a huge impact on the way they later deal with their own issues in life, whether it be in regards to mental health or something else. “Friends are the family you choose” and having a good, supportive and loyal network of friends around you can make the more difficult times in life a little easier to deal with. Having friends who constantly compete with each other, let you down or are too brutally honest, for example, can be as detrimental to your mental health as living full time in an “unhealthy” romantic relationship – especially within groups of friends where opinions may differ and individuals may feel pressured into acting or reacting in a particular way. A good network of friends, however, provides you with someone to check you’re ok, when you’ve have stopped checking up on yourself – which can be extremely important to those of us who live alone or are away from our families. Good friends can provide an unjudgmental ear – a free form of therapy that can be enjoyed curled up with a cup of tea on the sofa, or with a cocktail in hand in your local spa. For most of us the people who you will spend the majority of your time with – your work colleagues – are out of your control. Five days a week is a long time to spend in an environment where you feel uncomfortable or unhappy, or that breeds toxicity – sometimes having a negative effect on your overall mental health. Unlike friends – who you have chosen to share your time with – and family – who despite their shortfalls you love unconditionally – work colleagues are the people you spend eight hours a day, five days a week, 11 months of the year with. Learning how to detach your work life from your home life could help with your relationships at work – although it is easier said than done. If your work relationships begin to affect your mental health – especially outside of the office – it might be beneficial to take action, whether it be as simple as changing desks or as complicated as looking for a new job entirely, because the majority of your time is spent with the people you work with. Speak to a professional about how best to manage your relationships and how better to understand how your mental health could be influenced – both negatively and positively – by those who you spend the majority of your time with.